This badge was issued to Vy Tran on 06 Oct 2018. 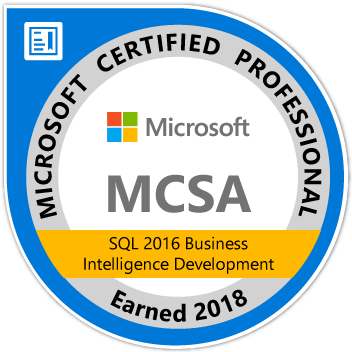 Earning an MCSA: SQL 2016 Business Intelligence Development certification validates extract, transform, and load (ETL) and data warehouse skills, along with skills for implementing BI solutions using multidimensional and tabular data models and online analytical processing (OLAP) cubes. This certification qualifies earners for a position as a BI developer.